Metropolis candidates are Billy McDaniel, Richard Corzine Jr., Julian “Butch” Adams, and Alderman David McManus. Brookport candidates are John Klaffer and Tammy Wessell. 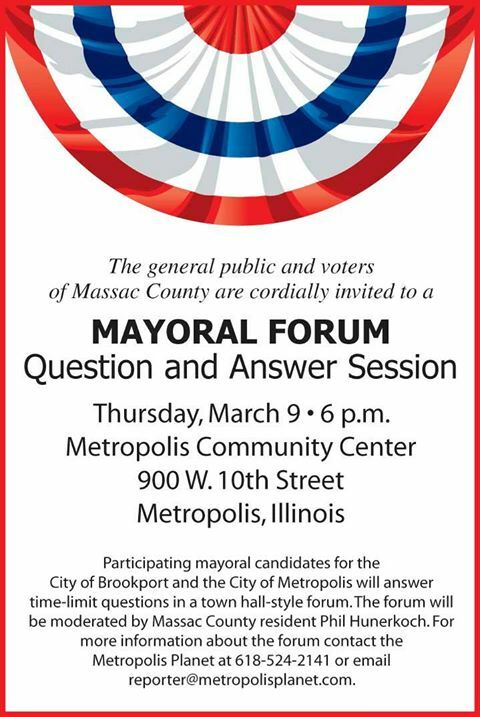 The first hour of the evening will concentrate on questions for Brookport candidates. The remainder of the time will be dovoted to questions for the Metropolis candidates. This entry was posted in All the Buzz - Bee Informed on February 27, 2017 by massacbeeswax.